Websites is the most important element for Internet and Internet is a most essential for this time. This Era is Globalizing day by day. Now we declare that Internet is a part and parcel for us. We use Internet regularly for our Daily work, Business and Education. When we search anything from Internet we can see, Internet brings some websites where contains our information. The Internet has many kinds of websites like Search engine, Social Media, Blog, Institute Website, Personal Website, Education website, Business Website, Government information website and many others. The Internet website position depends on website reputation, search visit, Quality content etc. Now I discuss and share with you about top 10 websites in the world with Similar web Rank. SimilarWeb is an Information Technology Company. It was founded in March 2009. SimilarWeb Headquarters in London. It provides many other services like Web Analytics, Data mining, Business Intelligence for an international corporation. 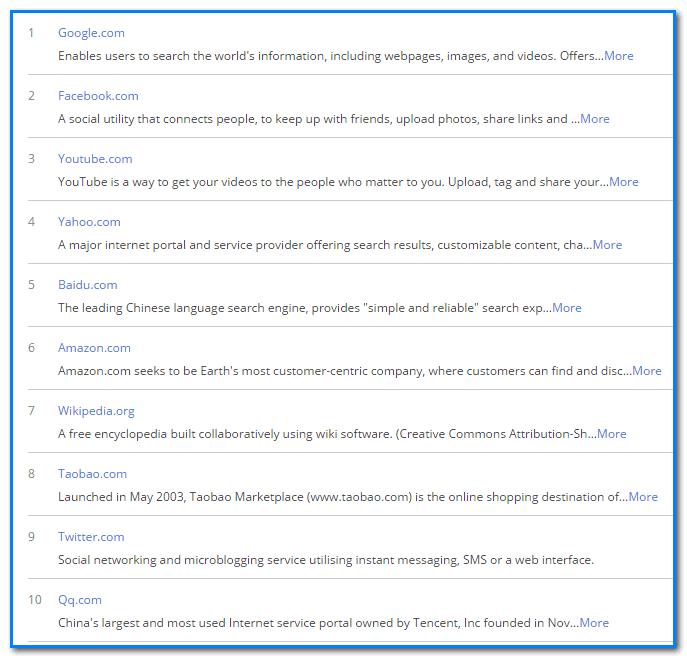 Those are Most important and useful top 10 websites in the world with Global rank in SimilarWeb & Alexa.